Welcome everyone to another blog here, on the new and improved DOINOW.com. As always, you can check out previous blogs on the right hand side of the site, follow me on twitter by checking out the right hand side of the site and really, there are so many features on that right hand of the site, I don’t even have the time to get through all of them! If you take anything out of this first paragraph, check out the right hand part of the site when you’re through with this blog! 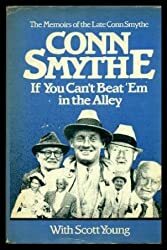 In continuing with some book reviews here, on DOINOW.com, I finally got a chance to sit down and read “If You Can’t Beat ‘Em in the Alley” by Toronto Maple Leafs architect Conn Smythe. Ironically enough, the “If you can’t beat ’em in the alley” quote attributed to Smythe and the title of this book, was a quote that he felt was misinterpreted by many members of the hockey media. Obviously, this is a New York Rangers blog site. As I talked about in other book reviews, I love history, especially American history. However, I do enjoy learning and boy, this book was a pure education. For an American, there were several times I had to hit Google to follow what Conn was talking about in his book. For example, in Canada “conscription” is the equivalent of war-time drafting, here in the States. Off the top of my head, other things I had to look up were things like knowing that Berlin, Canada was today’s Kitchener and looking at pictures of the old Union Jack Canadian flag. Throughout my interactions in life and reading books by Canadians, whether they are hockey books or something else, one thing is for sure, they are just as patriotic, if not even more-so as their American counterparts. In today’s liberal society (not a knock, it is what it is), people are allowed to criticize their country. Conn, like his American contemporaries, were true patriots to the core. The man was so devout to his country, that he even fought (and eventually injured) in World War II at the age of 50. What I took the most out of this book, wasn’t the hockey stuff. It was Conn Smythe the man. The family man. The business man. The sand man. The horse man. I was very well versed with his hockey career and tenure with the Leafs, but I didn’t realize he would’ve been a self-made millionaire without hockey. Hockey was just another chapter in his extraordinary life. Smythe’s autobiography, published in 1980, the same year that he died, was released posthumously. It is a full account of his 85 years as a human. Smythe, known to have an ego from his rivals, didn’t shy away from admitting it. At the same time, that is what drives successful people. You need to feel you are right and sometimes throw your weight around to be successful. That is what Smythe did. Smythe’s autobiography deals with everything in his life. Smythe talks about growing up with a drinker for a mother and how that affected him throughout his life. Smythe never drank, and in an era where Canadians, especially hockey players, were known for their drinking, Smythe never took part, nor would allow it during traveling to games with the team. Smythe’s life included a lot of tragedy, from his wife of nearly 50 years passing away from a brutal fight with cancer, to the death of his daughter at age 10, to the tax issues & eventual early death of his son, Stafford. 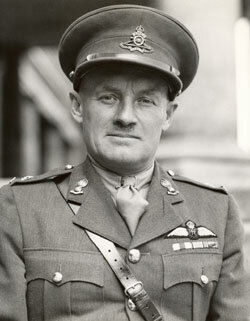 Smythe also talked about his battles with the Canadian government, what it was like fighting in both World Wars and his issues with Prime Minister Mackenzie King. Of course, my interest in this book was to learn more about the history of the formation of the NHL and about a self-made success like Smythe. Times were simpler then and Smythe admits that much, when he wrote this book in 1980 and talking about how he started his success 60 years before the book was released. For example, unions and government today, would never allow a man to just start buying up property and starting his own Sand (essentially construction today) business. Smythe was a very intelligent man. He talked about his gambling and how he picked his spots. He talked about how he approached finance. He also talks about how he could judge people and see who would fit what role and who could handle or not handle a job. A Conn Smythe memory I’ll never forget! When I started reading Smythe’s autobiography, I expected a book about hockey and nothing else. Smythe’s other stories is what really adds to this book and makes Smythe so much interesting as a human being. Smythe talks about the old Toronto St. Pats, why they existed and how he chose the blue & white colors when he created the Leafs. Smythe talks about his time as the first GM as the NY Rangers and what went into choosing players, for what eventually became a Stanley Cup winner. Smythe’s story about the creation and rise of the Leafs really makes this book. Smythe talks about the fundraising, how he got the unions to build the old Maple Gardens, how he did basically everything, from the ground up. Smythe talks about winning a Cup within five years and the legendary Leaf teams of the 1940’s. Smythe also talks about how war-time and being in a Canadian market gave him an advantage over the other original 6 teams. Popular stories, such as Smythe’s legendary gambling runs are discussed and how he was able to take money from his gambling to purchase the contracts of elite players of his era. Smythe also talks about his famous rivalry with Boston’s Art Ross. Like many people from his generation, Smythe wasn’t a fan of homosexuals and basically grouped them in with drug addicts and other derelicts. It was a different time then. It is funny, in Canada, race was never an issue, like it was in America. The NHL had no issues with black players if they could play. Canada has always been more progressive in social issues than America. I was surprised to see Smythe take a dig at the gays towards the end of his book. I wonder what he would feel like today, knowing that his great grandson, Tommy Smythe, is a homosexual? Usually, the staunchest people against homosexuality are the ones that come around when they know someone personally. This was a book I couldn’t put down and a complete 180 from the last book I read, “Playing with Fire” by Theo Fleury. Smythe wasn’t a mad-man like Theo, that’s for sure! I really enjoyed this book and for any hockey fan, or for anyone just looking to read a self-made success story, this is the book for you. As you can tell by my interest in American history, my soon petition to get Frank Boucher’s number hanging in the MSG rafters and my deep appreciation for this book, it is important to learn and promote history. We should never forget the people that came before us and contributed to our lives whether indirectly or directly. 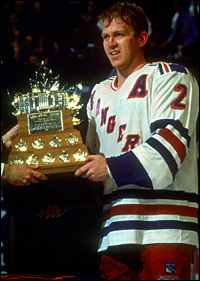 Smythe’s contributions to the Rangers, a team I’m a diehard fan of, led to a Stanley Cup, so thank you Smitty! Like Smythe, we eventually all get old and will die. It is important that we don’t let the memories die too. I hope this review sways you to check out this book, (I literally got it for 25 cents on Amazon.com) as it is a book that is rich with early NHL stories and what the world was like. I feel better for reading it. Keep it here on DOINOW.com for more hockey and sports blogs! NYR/Wild Recap: Metro Champs, Lundqvist, Charity, MSL Return, Miller Time, NHL PS, Playoff Thoughts, Byfuglien & More from a Division Winning Night!